Why can't so many children read? Many students arriving for the first time at Nimaro Education Centre had never held a book in their hands. Some were trying to read the books upside down and others were memorized by the pictures. The teachers’ excitement was similar to the children’s - they could not get enough of the pictures and information these books had to offer. Access to education globally has improved yet literacy rates have mostly stayed the same or even decreased. How can these children, that have been in schools for years, not read? There are multiple factors that contribute to low literacy rates beyond lacking access to reading materials. Many students have to walk a long distance to school. They may get tired along the way and decide not to go to school that day. Teachers may also decide to not show up to teach due to the fact they have not been paid and have to find work elsewhere or they may be unmotivated and take advantage of a system with no oversight. The ratio of children to teachers is very high in many developing countries. In the BBC Podcast referenced below, the ratio is 80 children in a classroom of 1 teacher in Kenya. Here in Uganda, it is common to find upwards of 200 children in 1 classroom! Imagine how lost a child must feel in this sea of children. Teachers only lecture from the front of the classroom. There is little feedback or participation from students. The classrooms are filled with nameless children who are expected to sit, listen and take notes for the whole day. Beyond literacy, comprehension rates are even lower. Teachers frequently only ask surface-level questions and do not challenge children with critical thinking or problem solving. This education system is setting up the children for failure. How is Nimaro Education Centre different? Children and teachers here have hundreds of books to choose from. Books and pictures can take a person to a different place. When teachers talk about an octopus, students can see an actual picture of how it looks! Classroom sizes are limited to 35 students per class and teachers have been trained to use hands-on learning, class participation and group work. Some of these students receiving this quality education still walk quite a distance to come to the school, however, when they arrive, they are fed breakfast and lunch so they do not have to go through the whole day hungry! There is a completely different atmosphere when one visits Nimaro versus a Ugandan public school. Our children look forward to coming to school to learn! Our teachers are invested in the lives of the students and want to build them up to be successful. We are happy to provide these children with a solid foundation and start to their lives! Beginning each day with an hour-long trip to the school over bumpy, dusty roads, I was astonished by the number of children walking alongside the road, hurrying on their way to school. Older children holding the hands of the younger. No mind for the cars, and even huge trucks, passing them so closely it would have been possible to reach out the window and touch them. Children on a daily mission of walking to school, happy to have the opportunity to receive an education. Occasionally, children were carrying pieces of wood which would be used for a fire to cook their meals on. Upon arrival at school I was greeted by such a feeling of warmth. Out-stretched hands and the greeting, “You’re welcome” was offered by teachers and students alike. Instantly, I knew at once this was going to be an encounter like no other I have previously experienced. While getting materials unpacked and ready for use, I was able to watch the teachers within the classrooms and I was truly impressed! Unlike teachers in the United State who have unlimited, readily- available materials, these teachers knew how to keep the students engaged with minimal resources. They were creative in their teaching methods and used songs, rhymes and very limited visual aids. Through repetition, students were learning how to speak English and were receiving their daily lessons. However, their teaching resources were tremendously increased by the materials brought from donations and supporters state side. Seeing teachers use materials never available to them before, I could tell how richly blessed they felt. No doubt my most humbling observations came from watching the children’s faces as they touched and explored items never seen before. From books, which sometimes were even being viewed upside-down, to materials which taught numbers and letters, the students were totally engaged in the moment, so eager to explore whatever they were holding. Their quest for knowledge was as instinctual as any child. Although language was a definite barrier, by using hand gestures and a reassuring smile, I did my best to present lessons to these precious children. As days passed we became more familiar with each other and a true bond was formed. I will never forget the girl who read a book to me that she had practiced for a few days; she was smiling from ear to ear with pride. It had not been often these children got to hold books, however, thankfully all that had now changed! As I prepared to depart, the staff and students expressed their heartfelt gratefulness for all that had been provided to them. No casual “thank-you” rather repeated handshakes and kind expressions; “Don’t forget about us when you get home.” “Tell everyone in the states, thank you!” Words spoken with sincere gratitude. The 28-hour trip home provided plenty of time to reflect; seeing people living with few modern conveniences yet completely satisfied, experiencing genuine gratitude from those who have so little, and the feeling that I should never take anything for granted. This small village will never be the same due to the outpouring of compassionate people. One week of classes has been completed. We are excited for every future week that will take place at this school - hopefully thousands upon thousands more! Every decision made for the school was carefully planned out. From the roof of the building being slanted to let the hot air escape through the ventilators. To each classroom having round tables instead of desks to encourage group work. 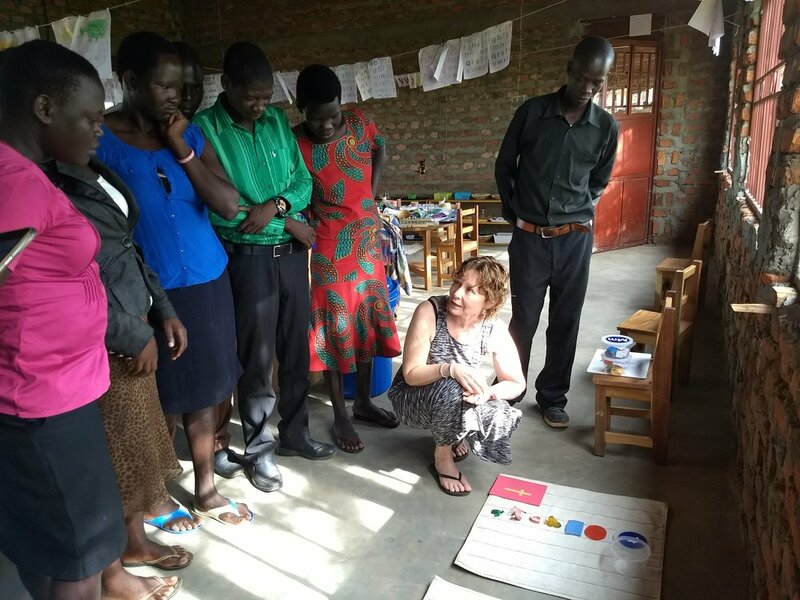 "Chalk and talk" is the typical teaching method in Ugandan where the children are lectured all day. We praise God for every child that has enrolled in our school! Our expectation was around 100 children. On Friday, we had to cut off enrollment because we had over 200 children! We know these children will be getting a quality education and learn about our magnificent Jesus! Our whole goal as an organization is to empower families for a bright and sustainable future. One of the best ways to accomplish this goal is through education. We are working with both the children and their parents to break the cycle of poverty. The time the school is needed is NOW! We have students that are 12 years old enrolling in our kindergarten class. These children have never set foot in a school and most likely know little to no English. The teachers and our whole staff have our work cut out for us! But we receive our power from our Great God. With the increased amount of children, we need more furniture and supplies for the children. This comes out to be around $40 to give each of the 132 new children a seat, shared table, notebooks, pencils, pens, and eating dishes. Will you please help with this initial cost so that each student has a chair to sit on, a book to write in, and dishes to eat from? Your partnership with us gives not only these beautiful children, but their entire families, the opportunity to come to know Jesus and receive an education and livelihood. Thank you for being part of what GOD is doing here through Ignite Change! As each week passes, we are getting closer to breaking ground for our Primary School! Our architect has given us a few sketches of what the school will look like. It continues to build our excitement as we now have a clear picture of the design. After we knew God was calling us to build this school, we began praying for land. God opened up many doors for us to purchase 4 different plots next to each other to have an area big enough for all the school buildings needed. You can see a picture of the land here. Almost all schools in Uganda (and most of Africa) look the same. They have a symmetrical roof with no overhang. We began looking at different options available and a TED Talk from an architect in Togo came up in our searches. He had tilted the roof of the school in order for the hot air to escape. The idea is so simple yet can help keep the classrooms cooler in the village of Ngai where the school is being built. We began meeting with architects and discussing tilting the roof. Many of the architects told us it was "not possible" so we continued searching. Thankfully, we found an architect who was able to bring our vision to life! And at the same time, we are able to employ all Ugandan employees for the design and construction of the school.